(Nanowerk Spotlight) New work at the University of Arkansas at Little Rock has, for the very first time, demonstrated that Raman spectroscopy can be used to detect and monitor circulating carbon nanotubes in vivo and in real time. These findings could have a significant impact on the knowledge of how nanomaterials interact with living biological systems. Carbon nanotubes (CNTs) can be used for various advanced bio-medical applications. Before any clinical application of nanoparticles, it is imperative to determine critical in vivo parameters, namely pharmacological profiles including nanoparticle clearance rate from the circulation and their biodistribution in various tissue and organs. Until now, their distribution was only monitored by collecting samples after various time intervals, but this new research shows the ability of monitoring their concentration in vivo and in real time, while the animal is alive. Moreover, this work can be extended to the detection of circulating cancer cells that have been tagged by carbon nanotubes. "We were motivated by the desire of being able to visualize individual carbon nanotubes moving in lymph, blood and tissues," Alexandru S. Biris tells Nanowerk. "Prior to our work it was not possible to visualize carbon nanotubes in vivo in real time or to observe how cancer cells migrate through circulation." Biris, Chief Scientist and Assistant Professor at the University of Arkansas Nanotechnology Center, and his collaborator Vladimir Zharov, Professor and Director of the Philips Classic Lasers and Nanomedicine Laboratory at the University of Arkansas for Medical Sciences believe that in vivo flow cytometry using Raman detection technique is very promising for counting and identification of individual circulating nanoobjects with strong Raman scattering properties, and this technique can be supplementary or alternative to existing fluorescent and photoacoustic methods. The researchers have reported their findings in the April 28, 2009 online edition of Journal of Biomedical Optics (In vivo Raman flow cytometry for real-time detection of carbon nanotube kinetics in lymph, blood, and tissues). a) Schematic of the in vivo RFC for real-time monitoring of carbon nanotube biodistribution in a complex biological environment e.g., in lymphatics based on their strong Raman scattering and unique Raman spectra b). c) The spatial structure (left) and TEM image (right) of carbon nanotubes with diameters ranging between 1 and 2 nm; these nanoparticles in PBS solution were injected intravenously in the bloodstream or in skin. d) Human cervical cancer HeLa cells were incubated with carbon nanotubes and injected in lymphatics or ear skin. "Previously, Raman spectroscopy has been applied to monitor CNTs in vivo in static condition, demonstrating large signal-to-noise ratios and molecular specificity due to the strong Raman scattering signals from CNTs and their specific vibrational spectra fingerprints, respectively," Biris explains. "Raman spectroscopy was successfully used also in in vitro flow cytometry using surface-enhanced Raman scattering (SERS) nanoparticles. However, the application of Raman flow cytometry (RFC) for in vivo studies as we have demonstrated, especially for single cell detection, is a novel approaqch." 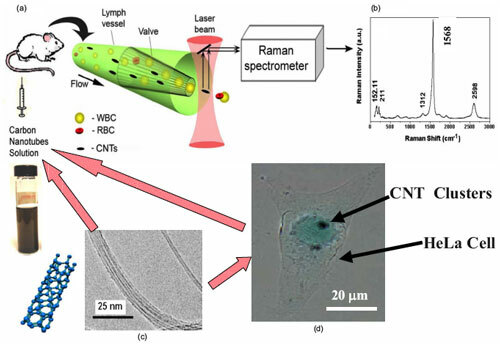 Using single-walled CNTs (SWCNTs), the research team demonstrates the nanotubes' ability to serve as excellent in vivo Raman contrast agents with unique Raman scattering spectrum. Raman spectra of CNTs contain characteristic bands in two spectral regions. The researchers found that the so-called G band has the highest intensity (referred to as Raman signals) and therefore they used it to dynamically evaluate the presence of CNTs in the biological environments in vivo. Zharov says that this technique in time-resolved mode may provide high sensitive detection of a limited number of nanopartilces in the small irradiated volume of blood and lymphatics on animal models, as well as selective detection of single cancer cells targeted by these nanoparticles. "We believe that with new technique it would be possible to integrate detection of circulating tumor cells with almost simultaneous their laser killing using the same nanoparticles as photothermal agents," says Zharov. "Basically, it should be possible also to real-time monitoring the circulation of various nanomaterials and their accumulation into normal tissue and potentially into the tumor using Raman spectroscopy in dynamic and conventional 'static' modes, respectively." A major challenge for nanomedicine researchers is to use nanomaterials bio-conjugated with antibodies, proteins and other ligands to target selectively both single circulating tumor cells and tumors with many cancer cells. The interdisciplinary team of physicists, biomedical engineers, chemists, biologist, and physicians from the University of Arkansas at Little Rock and the University of Arkansas for Medical Sciences team are working on further improvement of this technique by increasing its sensitivity, time-response and specificity as well as by combination with photoacoustic flow cytometry and thermal ablation of individual cancer in real biological background.